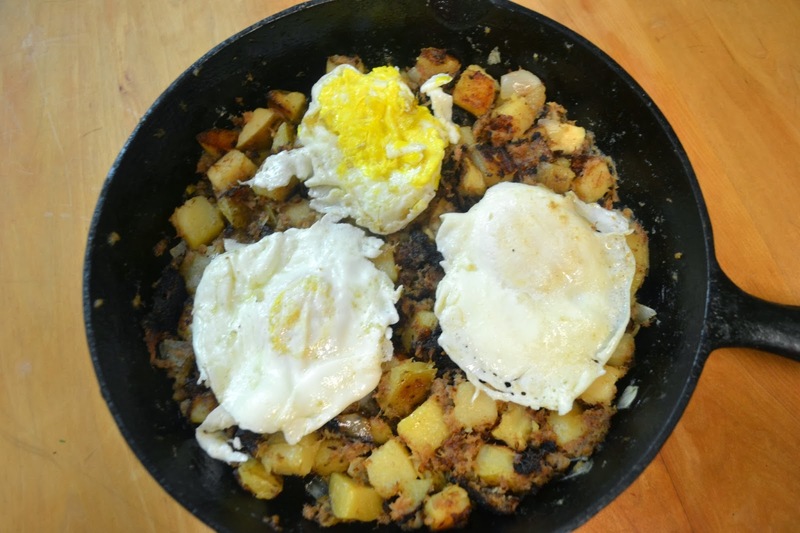 Making Hash with leftover ham,corned beef, or pot roast, is easy and so delicious you will never buy a stored bought can again! Today I am using a chunk of left over ham for this skillet dish. Left over roasted potatoes or a couple of cans of diced potatoes will make this an easy dish to throw together. In about 10 minutes you can have a great breakfast or even a dinner pulled together. Jan's Tip: This recipe calls for both butter and olive oil. This is because butter will burn or smoke quicker than oil. You use butter for flavor and oil to keep it stable and not burn up. Over Medium high heat add butter and olive oil. Cook, stirring frequently till onions are tender and translusent. Add diced potatoes and diced meat, stir gently to mix with vegetables. Flatten hash with the back of spatula to an even layer in skillet. Set kitchen timer for 5 minutes and let cook without stirring. (Feel free to keep an eye on it though, as stovetop temperatures vary by stove). Gently lift a portion of the hash with spatula and check for a nice crispy, brown crust. When the bottom of hash is a nice crispy brown, gently flip sections of the hash till it is all flipped over. Yep, I forgot to clean my stove top and make the sides of my skillet look perfect before snapping the picture! Real life kitchen with hungry family waiting here! Set timer again for about 5 minutes, till both sides are crispy, brown. Jan's Tip: The key to success with hash is to NOT stir it too often, or it will never get that crispy crust you want. While the skillet is cooking I usually cook some eggs (over easy for my hubby, and a "non runny" yolk for me).